Yesterday was my day to reminisce around the Inland Empire and stock up on groceries that I cannot find Back East. I am surprised that I only spent $14 at the Fresh and Easy on supplies to take back home. I also went to BevMo, the local big box store for beer, wine and liquor, to pick up a 12-pack of Fat Tire Beer. Again, this is the good stuff that we can't get in Maryland or almost anywhere east of the Mississippi River (they sell it in Tennessee, and maybe now North Carolina, but I'm not hedging my bets on that). If I lived in most other states, this would not be a problem, and I could just ship it back home. But we live in a state with such blaring blue laws that we are not even allowed to mail alcoholic beverages to our own houses. They can also sell alcohol in their supermarkets outside the Old Line State, people. On Sundays. Everywhere. It's true, people. making sure they don't push the total weight of the luggage above 50 lbs. After doing some quick research on the internet, I found some good tips from people who transport or have transported a lot of beer and wine through their luggage. The most common tips I found suggested the following for a case of beer: wrap each bottle in a sock (and/or bubble wrap), and then zip it up in a Ziploc bag. Make sure the beers are all packed as close to the center of your luggage as possible. It's similar for wine: wrap each bottle in a towel and/or bubble wrap, and then wrap it all in a plastic bag. If you have a big enough Ziploc bag, put it in there. Since I couldn't really use other people's socks, I had to buy some. This required a trip to the local 99¢ Only (a big and increasingly popular chain in California and much of the Southwest), where I bought two packages of ankle biters for a grand total of $1 each. Add to that a box of 12 Ziploc bags for $1 and two dish towels for $1 each, and I was ready to do my packing (NB: I also found Cadbury Cream Eggs from Easter for 25¢ each; only a few were oozing). When I found out that a 12 pack of Fat Tire weighs all of 15 pounds (thanks for the use of the scale, Jim), I had the new problem of decreasing the weight in my suitcase. As a result, I am using some of my clothes as packing material for those groceries I bought. 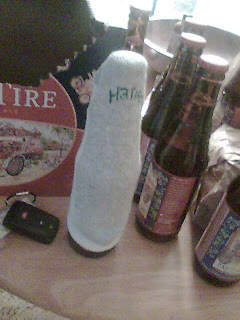 My first step was to take the beer out of its box and start wrapping each one in a sock. At first I just slipped it over the beer, but I figured out that by readjusting the sock I could cover top and bottom, and then staple the sock shut. The part of the sock that still exposed some of the bottle got some toilet paper stuffed next to it before I fit it snugly into its gallon-size Ziploc bag. With all of the extra padding I could only fit ten of the bottles into the box. Don't fret, beer fans! I left some for Gil (I would've left some for Jim, but he isn't really a beer person). Even better, after all was said and done the total weight of the box had decreased to 13.5 pounds! That was minus 2.5 pounds for losing two bottles of beer, and adding one pound of packing material (socks, Ziploc bags, newspaper, tape). The wines, which added another 7 pounds of weight, were a different matter, as they didn't come in their own convenient box. The first step was to wrap each wine bottle in its own towel, and then wrap the towel in a plastic bag. Voila! The final product. Yes, those are Berger's cookies in the background. I always bring them as gifts. Of course, I've heard no complaints yet. After sandwiching the 13.5 lb box of Fat Tire and the two Joseph Filippi Wines into my suitcase amidst tennis shoes, travel kit and clothes, I took one final measurement. The final weight: 40 pounds! I had a convenient 10 lb buffer zone just in case I needed to slip something else into my luggage. I'll let you know tomorrow how well it worked. I tell you, my mouth started watering the instant I saw the Fat Tire in your pictures. I lived in Fort Collins for a year and a half, so I'm very familiar with everything from New Belgium. I have friends driving over from Fort Collins in less than three weeks. If you have issues with getting yours back, let me know, I might be able to score you some. I will do that! I wish they would finally move out here, though. Maybe they'll see the blog post and think "Ah, Maryland. We should get out there!" But they won't. Addendum: I will do that if there are problems. Thanks, man! 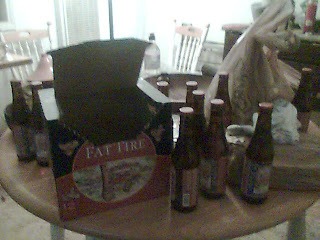 I can say for a definitive that Fat Tire is available in North carolina. I just picked up a Bomber of it in a convienence store just off of I-95 in April. So I guess the next time I can just drive down to NC for it!